When doing verification of material models it is a very good idea to check both uniaxial stress and uniaxial strain states. For a von Mises material, we can analytically determine what displacements and stresses will be present when the material yields. The following table was created to aid those that work with the von Mises (or J2 plasticity) material model. 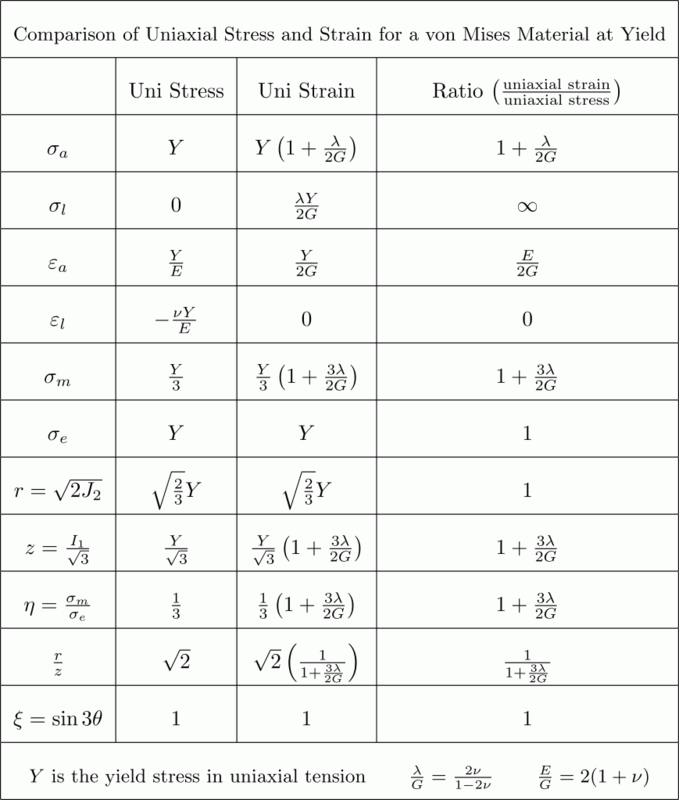 There are only three parameters that are used for the table; specifically, the yield stress in uniaxial tension and any two elastic modulii. The table was written so that if only Young’s modulus and Poisson’s ratio are known, the reader can derive any other required values by using the equations included at the bottom of the table. The LaTeX source for the table can be found here. This entry was posted in General Tutorials, Thoughts and Tips. Bookmark the permalink.